The Texas Instruments TIL311 is the definitive example of hexadecimal smart display technology. 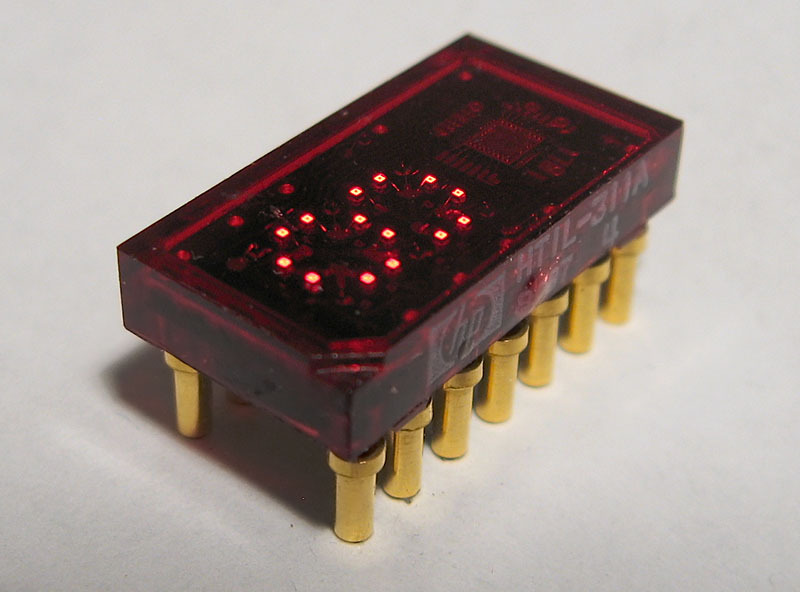 Used in innumerable electronic systems over the years, the TIL311 contains a BCD decoder and a hexadecimal character set in addition to its LED elements. The TIL311 is larger than HP's competing 7300 series of displays, but can still be inserted into a standard DIP socket. The TIL311 is so popular that they are still manufactured to the current day, and see use in a number of short-run industrial control systems and test fixtures. The TIL311 is such a popular part that it has been second-sourced by numerous vendors over the years. The example shown in the thumbnail is a Hewlett Packard HTIL-311A, which is a drop-in replacement for the TIL311. The HTIL-311A includes numerous production enhancements, including an attractive cast plastic cover and a pin-1 locator molded into the surface of the display face. 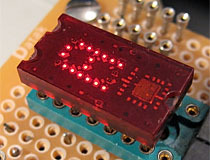 Texas Instruments TIL311 LED display, normal operation. 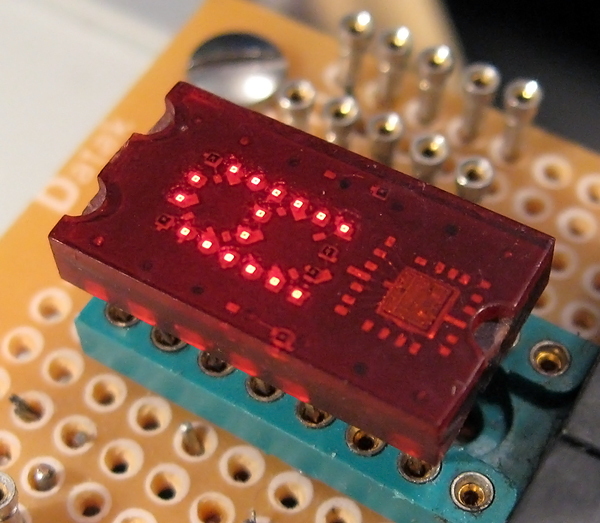 The TIL311 is one of the most popular integrated decoder LED displays ever produced. 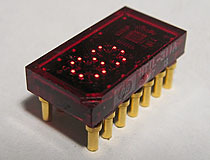 The HTIL311A LED, manufactured by HP, is a second source version of the TIL311. Differences include a cast plastic cover and a substrate made from PCB material instead of ceramic. 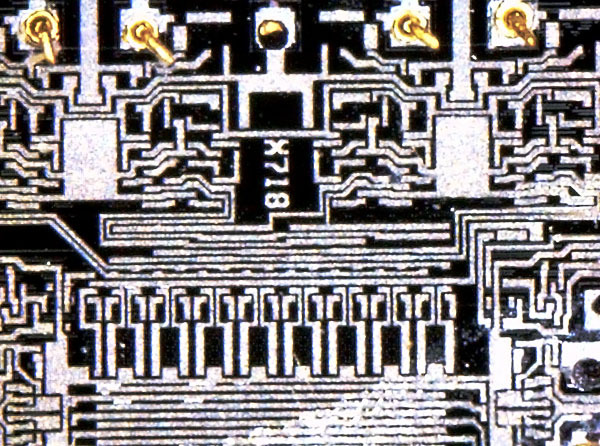 TIL311 decoder die, 20x magnification. 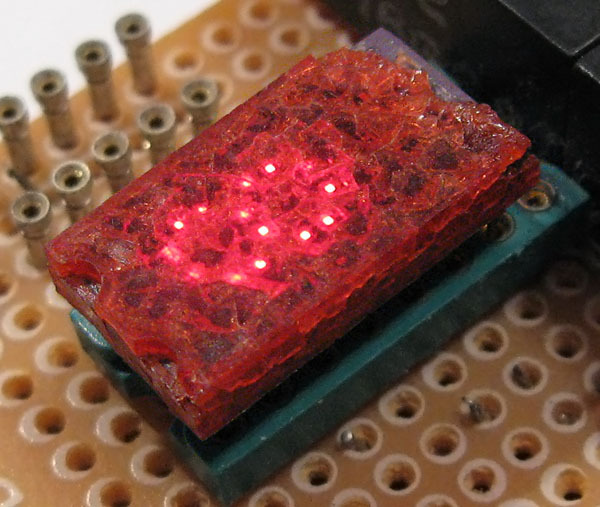 The display's red epoxy coating was chemically stripped on this example to provide a clear view of the decoder IC. 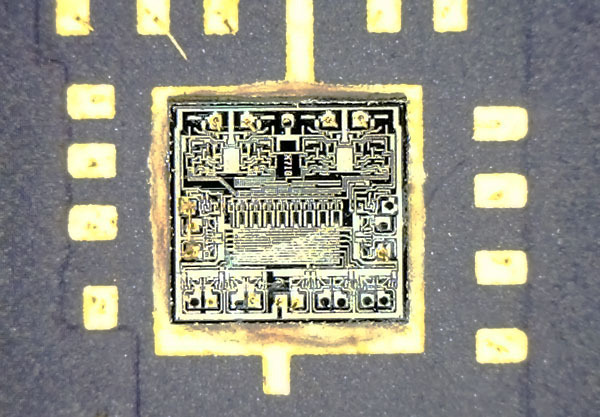 TIL311 decoder die, 100x magnification. This HTIL-311A display had a broken cover which allowed the internals to be photographed. 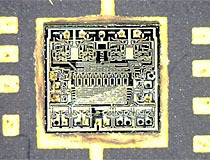 The PCB substrate is quite apparent with the red filter removed. TIL311 displays are vulnerable to the slow breakdown of the plastics in their epoxy packages, usually from improper storage. 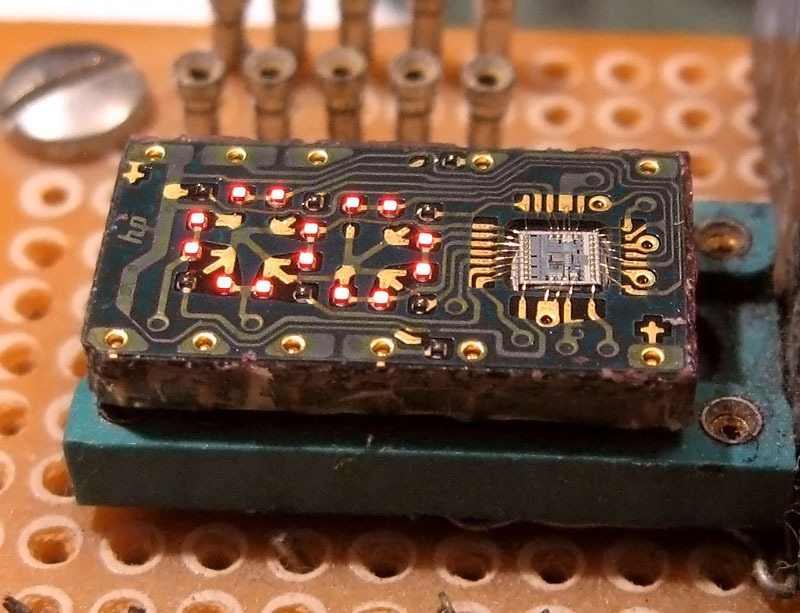 This photo shows a rather extreme example of epoxy degradation; it is amazing that this display still functions at all with such a severe amount of plastic breakdown. This type of plastic degradation closely resembles the 'acetate rot' suffered by collectors of vintage casino dice.